UNDERSTANDING THE ROLES OF ELECTRONIC AND STERIC EFFECTS IN SEPARATING ISOMERS USING DIFFERENTIAL MOBILITY SPECTROMETRY. Assessing the impact of anion–π effects on phenylalanine ion structures using IRMPD spectroscopy. Michael Burt, Kathleen Wilson, Rick Marta, Moaraj Hasan, Scott Hopkins, Terry McMahon.Physical Chemistry Chemical Physics. 16(44): 24223-24234. . Persistent Intramolecular C–H···X (X = O or S) Hydrogen-Bonding in Benzyl Meldrum’s Acid Derivatives. W. Scott Hopkins , Moaraj Hasan, Michael Burt, Rick A. Marta, Eric Fillion, and Terry B. McMahon. The Journal of Physical Chemistry A. 118(21): 3795-3803. . Investigate solvation propensities of model analytics in FAIMS system and computationally to develop methods for predicting batch solubility. The Diavik Diamond Mine in the North Slave Region of the Northwest Territories, Canada/ The site where the majority of the groups soil samples were taken. Diverse morphologies of processed silk. [Left to Right] A) Silk Elastin Nanoparticle. B) PVA silk microparticle. C) AFM micrograph of dragline spider nanofiber.D) SEM micrograph of a pH induced B.Mori hydrogel. SPECTROSCOPIC ANALYSIS OF RESIN-BOUND PEPTIDES: GLUTATHIONE AND FK-13. Contribution: Developed methods for molecular dynamics simulations and performed the subsequent DFT calculations to investigate gas phase structures of glutathione. The generated results were placed in continuum models to corroborate through space interaction seen in NMR studies. INVESTIGATING ANION-QUADRUPOLE INTERACTIONS OF PHENYLALANINE AND FLUORINATED PHENYLALANINE DERIVATIVES USING DENSITY FUNCTIONAL THEORY AND INFRARED MULTIPLE PHOTON DISSOCIATION SPECTROSCOPY. Contribution: Generated the IR-MPD spectra Centre Laser Infrarouge d'Orsay in Orsay France used to identify spectral features to assign computational determined stationary point geometries. ANTI-INFLAMMATORY ACTION OF AC2-26 NANOPARTICLES IN HEART DISEASE. Moaraj Hasan, Raymond Chaisson. . Farokhzad Lab Presentation, Harvard Medical School, Boston, United States [Seminar Presentation]. STRUCTURAL CHARACTERIZATION OF ALKALI METAL CATIONIZED CYSTEINE COMPLEXES. 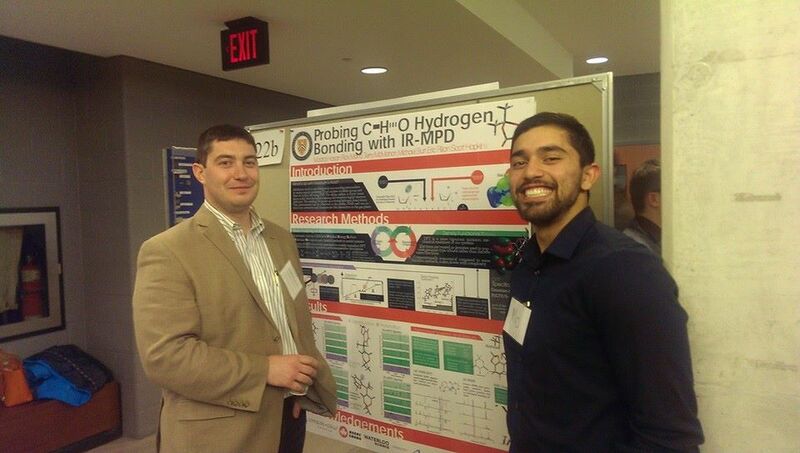 Christian Ieritano, Moaraj Hasan, Michael Burt, Rick Marta, Terry McMahon and Scott Hopkins. . Southern Ontario Undergraduate Student Chemistry Conference 2014, Windsor, Canada. [Competitive Seminar Presentation]. INTEGRATING GPC IN DEVELOPING PLGA-PEG NANOPARTICLE SYSTEMS. IDENTIFYING ANION-Π INTERACTIONS IN HALIDE-BOUND PHENYLALANINE DERIVATIVES USING IRMPD SPECTROSCOPY. Michael Burt, Kathleen Wilson, Rick Marta, Moaraj Hasan, Scott Hopkins and Terry McMahon. . Symposium on Chemical Physics, Waterloo, Canada. [Seminar Presentation]. Moaraj Hasan , W. Scott Hopkins , Michael Burt , Rick A. Marta , Eric Fillion , and Terry B. McMahon.. Symposium on Chemical Physics, Waterloo, Canada. [Poster Presentation]. PERSISTENT INTRAMOLECULAR C–H···X (X = O OR S) HYDROGEN-BONDING IN BENZYL MELDRUM’S ACID. DERIVATIVES. GAS‐ PHASE STRUCTURES OF CHLORIDE‐BOUND PHENYLALANINE DERIVATIVES DETERMINED BY IRMPD SPECTROSCOPY AND COMPUTATIONAL CHEMISTRY. MICROSOLVATION OF URANYL WATER NANOCLUSTERS. Jessie Baldwin, Moaraj Hasan, W.Scott Hopkins. . Presentation for Collaborators at the University of Guelph, Gulph, Canada. A presentation describing a theoretical overview and preliminary results in uranium micro-solvation done at the Hopkins group. Moaraj Hasan, Jessie Baldwin, W. Scott Hopkins. . Symposium of Chemical Physics, Waterloo, Canada. Section: Selected experiments for students to understand concepts taught in CHEM 266 lecture. This includes structure, nomenclature and reactions of important classes of organic compounds, stereochemistry and its role in reaction mechanisms. Section: Introduction to microbial ecology, environmental microbiology, food microbiology and medical microbiology. This course has an integrated lab component to supplement the lecture material. This course covers nature of electromagnetic radiation and an elementary outline of quantum mechanics in one dimension. I developed a series of videos to supplement the lecture material including a review of concepts and worked out examples.